Ask any b-to-b salesperson: closing the so-called "complex" sale has never been harder. One reason is that buyers now don heavy armor plating against outside salespeople each morning before they get to work. Another is that there just aren't that many buyers any more. Rather, there are committees. Yuck. It's no wonder 48 percent of sales reps missed their quota last year, according to research firm CSO Insights. 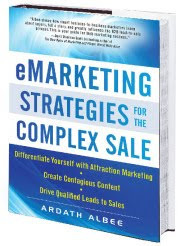 pages of Ardath Albee's new book, eMarketing Strategies for the Complex Sale. Albee, CEO of her own e-marketing firm, has written a compact users guide to attraction marketing that clearly shows she "knows her stuff." In a clear, stepwise manner she explains how companies can capture and nurture leads in a world where buyers are "staying elusive longer." Included are hundreds of sound suggestions for deepening your understanding of prospective customers; creating "contagious" content; and fostering progressive sales conversations. The attraction techniques Albee presents are backed up in all cases by clear examples proving how they work and why. "In the past, marketing created content that focused on making prospects aware of the company's products so they'd consider shifting their buying dollars. Prospects who showed a bit of interest were then placed into the sales process. This approach was successful prior to the Internet because prospects needed to talk to salespeople to get the information they needed to solve their problems. We all know that this is no longer the case. Buyers now can scour the Internet, attend Webinars from their offices, and even participate in virtual events without ever speaking directly to a salesperson. Companies who are investing in customer-focused content are capturing the lion's share of prospect attention. Marketing's responsibility expands beyond interest generation to building engagement throughout the buying process. Yes, even after salespeople become involved." By all means read eMarketing Strategies for the Complex Sale. And if you haven't read Jeff Thull's Mastering the Complex Sale, read both books in conjunction, because they both tackle the same challenges. You'll think about b-to-b marketing in a whole new way.